Usually it's rare to cook for one as I normally cook for two, but truthfully I would rather cook for a crowd. 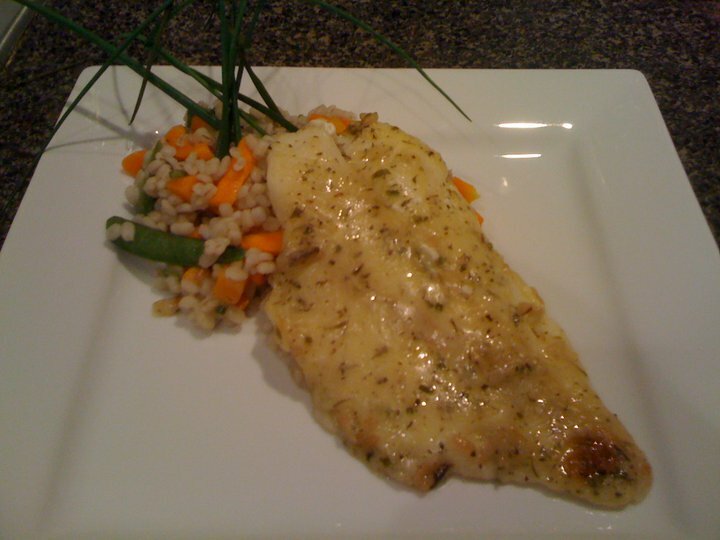 Last night I made Orange Roughy with a Sherry Herb Sauce and then my side dish was Pearl Barley, Sugar Snap Peas, and Carrots in a Basil butter sauce. I slightly changed the initial recipe - it was suppose to have tomato slices on top of the fish. I left them off. Who wants warm, soggy tomatoes on top of fish anyways? In thinking about the sauce, I think that the use of Sherry may not be the best idea. The sauce in many ways makes me think of the flavour of the sauce that usually is paired w/ Chicken Divan (minus the parmesan cheese). This was easy enough to make, elegant enough for company, but I would suggest a pinot grigio in the sauce as opposed to the Sherry. Now I know many people will first think "Don't use a cooking Sherry" - well fortunately I listen to good advice and I used a regular Sherry. I didn't add any other seasonings like I normally would, but think I'll add in some rosemary next time I make this.